Hello! Thank you for visiting our new Haspin Acres website! We're thrilled to finally be up and running, and we're excited to have you visit our new and improved website with updated information and a more user-friendly interface, created just for you! We hope that as you navigate through the pages of our new website that you will be able to find all the information you are looking for about the features, events, and services offered at Haspin Acres for all your off-road adventures! We look forward to serving you, and if you should have any questions or comments about our new website or our park, please feel free to visit our "Contact" page and send us a message. Our new season is well underway, and we have many exciting events scheduled for your summer fun and recreation! We hope you will check back here often for the latest information on park events, schedule updates, race results, and other important park information. 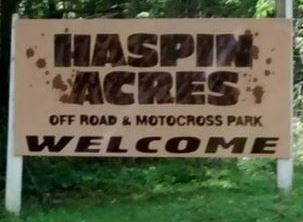 THIS is the place to come for all things Haspin, and we look forward to having you join us for another thrilling season of off-road action and adventure!